This is a taco with a handmade tortilla. “This is Taco Country!” Those four words—painted on the burnt orange façade of San Antonio’s legendary breakfast taco haunt, Taco Haven—are carried in every Texan’s heart and stomach. 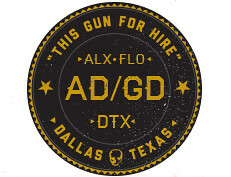 They are as fundamental to the Lone Star State’s identity as Friday Night Lights, “Pancho & Lefty,” and Dr Pepper. This is true across our tortilla-based wonderland from Big Bend to the Piney Woods and South Texas to the Metroplex. I’m not only referring to the fried envelopes whose broken shards litter much of our cultural landscape. No, I mean all the tacos: jaralillos de res, carne asada tacos smothered under a salty tarp of queso fundido at Tacos El Toro Bronco in El Paso; the ground beef-nestling airships that are Ray’s Drive Inn’s puffy tacos; the slivers of paprika-lacquered pork served across Oak Cliff; Brownsville’s many Sunday barbacoa huts; the big-city gals that love dressing up; the just-this-side-of-familiar menu at new regional restaurants; and, yes, breakfast tacos. Get me talking about tacos and see me light up like a child who receives the exact gift he wished for Christmas morning. From their history and folklore to their variability, there is much joy in tacos. In no particular order, these are the tacos that brought me that joy in 2014. 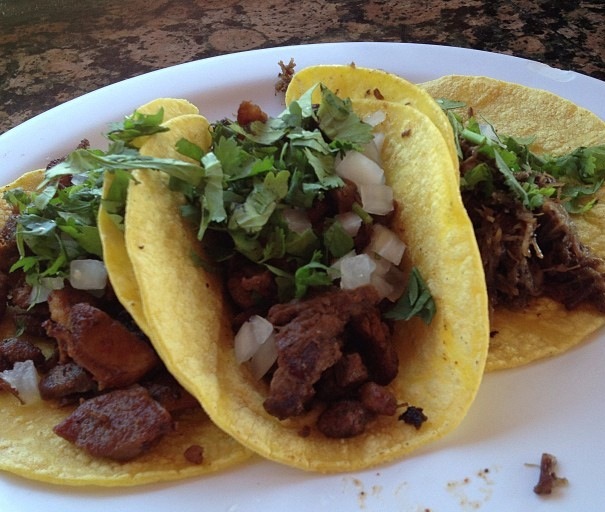 A plate of tacos at Los Torres. Unlike the barbacoa commonly available in Texas, this specialty of Sinaloa (where the Torres family has roots) is a mix of beef and pork, dark red from chiles colorados and fragrant spices. It’s always included in my order at Los Torres, where homey braises and handmade tortillas band together to give Dallas it’s best taqueria. When you visit the little spot in Oak Cliff—and you will—resist the urge to order tortillas de maiz hechas a mano. Go for the thin, nearly translucent handmade flour tortillas characteristic of Sinaloa. 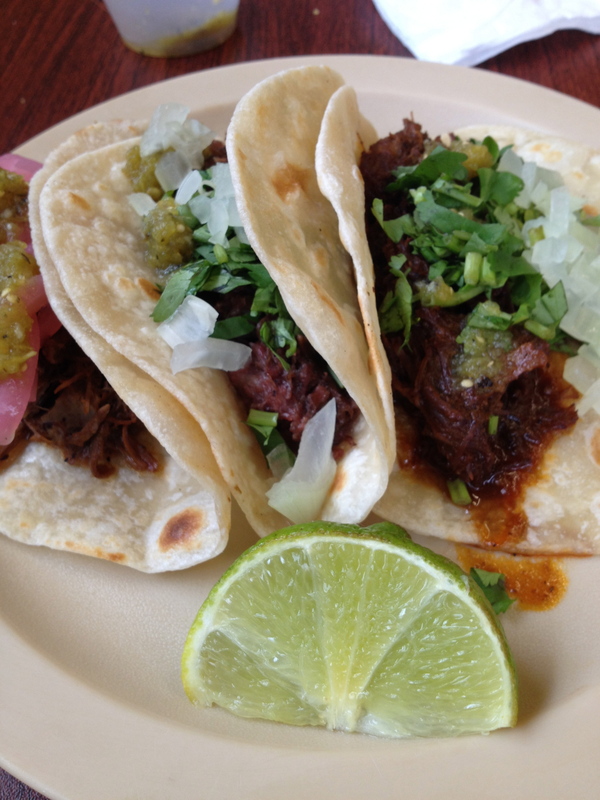 The table-hushing barbacoa at Gerardo’s on Houston’s east side is among the best I’ve had in Texas yet. It’s silky and full, though delicate, and pulled directly from the cows’ head. My visit to Gerardo’s included a kitchen tour from Owner José Luis Lopez—Gerardo is his son—who obviously has pride in his work. He propped the cow heads for photos taken by the crew I was running around Houston with that morning, amigos in food J.C. Reid and Michael Fulmer, cofounders of the Houston Barbecue Festival, and photographer Robert Strickland. 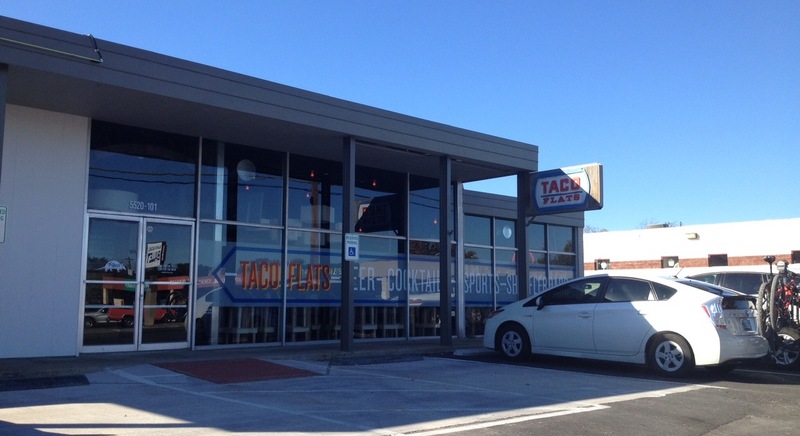 Taco Flats’ modern and sleek exterior. Taco Flats was the taqueria I most anticipated in 2014. Named, with permission, after a legendary Austin bar and rock club, the business from owner Simon Madera, a Rio Grande Valley native and restaurant industry veteran, opened in November. 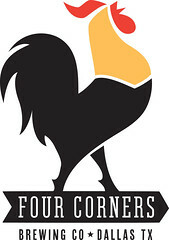 It has become something of a craft beer bar-modern taqueria along a stretch of Burnet Road that is becoming a taco hub. The taqueria is in the same strip center as the brick-and-mortar home of fancy lonchera Peached Tortilla and a short walk from Fork and Taco, which has an Uchi alumnus in its kitchen. Fork and Taco is an admirable restaurant that understands the importance of the handmade tortilla, but this is a review of Taco Flats, not Fork and Taco. That post is forthcoming. 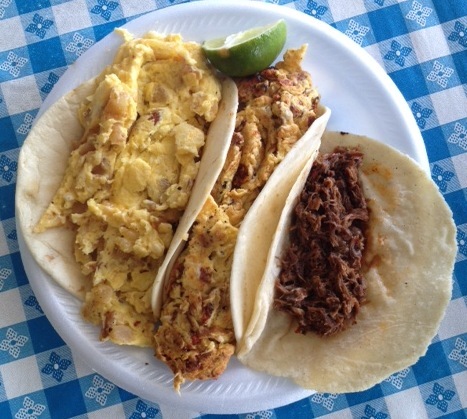 Potato & egg, bacon & egg and barbacoa de chivo tacos at La Fruta Feliz. A friend and I were finishing errands in East Austin when I caught a glimpse of La Fruta Feliz in my peripheral vision, and without much prodding my friend turned his car around. In we went hungry for handmade tortillas, for what I heard were knockout tacos. Being in the land of breakfast tacos, I ordered a potato and egg and chorizo and egg taco on flour tortillas with a taco de barbacoa de chivo (goat) on the house corn. Welcome to Veracruz All Natural. After two foiled attempts, my excitement was high for the third try, the sure thing. I was finally going to enjoy what droves of Austinites laud as one of their greatest breakfast taco purveyors, Veracruz All Natural. 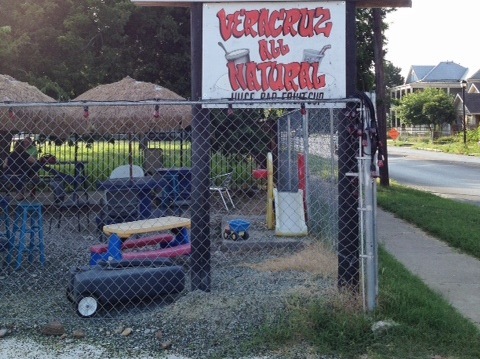 The original location of the family operation of two trailers and a forthcoming brick-and-mortar sits adjacent to a party store and a barbecue trailer on Cesar Chavez Street, cordoned off by chain-link fencing. Within the confines of the fence, the ground is a mix of broken bottle glass and gravel on which plastic toddler playground equipment, a slide, a picnic table, sat. The rest of the seating was a re-purposed industrial wood spools shaded by straw umbrellas to give the place a coastal feel—the owners are from Veracruz, Mexico—and lawn furniture. Monterrey Café was difficult to find on a rainy Sunday morning en route to Dallas from San Antonio. A friend’s Google Maps iPhone app pegged it on one side of I-35. My search had it on the opposite side. When we did find the restaurant, we what we found was a freestanding building with colorful murals on its exterior. One the façade, a matador toyed with a bull. A front window bore a scratched, sans serif font in pink declaring homemade flour and corn tortillas. While the south wall a man walked alongside an oxen-led cart. The parking lot was full. A welcoming, potentially great roadside shack, if ever there was one. This is a hole in a wall. Really. Wedged between a laundromat, a hair salon and a convenience store, Taco-Mex is an orange color-framed walk-up taco window. From the menu at the right are available $1.75 vinegar-spiked cactus strips embroiled in scrambled eggs, refried beans speckled with whole pintos and a network of melted cheese, peppy chorizo and egg as well as migas minus the Scoville slap of jalapeños. The $2 barbaoca is a greasy cowhead-lovers dream and would make admirable hangover salve. It wasn’t planned. 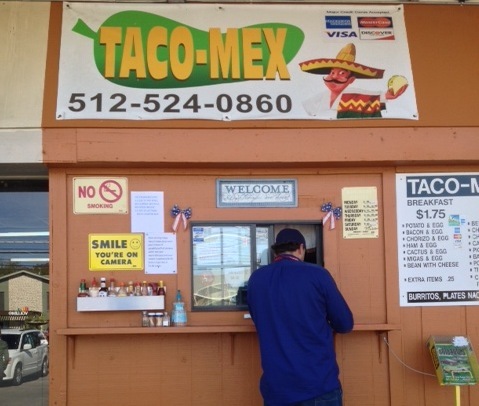 Our Austin taco stop on the return trip from a Brownsville taco tour weekend was supposed to be El Taco Rico. Unfortunately, it was closed. El Taquito, a fast-casual chain outpost on Riverside Drive, was a backup-backup choice. We were there for pork, specifically al pastor from a trompo, after consuming almost nothing but beef in the Rio Grande Valley. A couple tacos al pastor from some joint off the highway would be all that was needed to hold us over until we got home. As it turned it out, I had been to El Taquito before. 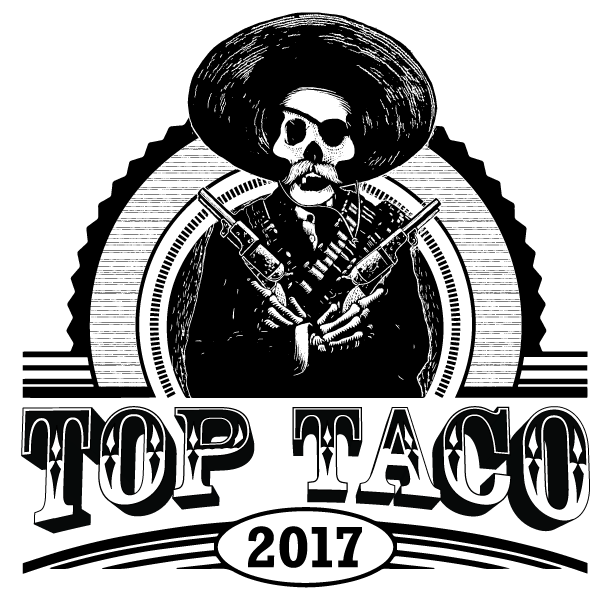 On my first visit, midway through an East Austin taco crawl, Roberto Espinosa tried to warn me about the fried tripe before I bit down on a substance that was more PVC tubing than edible offal. But it wasn’t time for tripe. It was time to leave behind cow country and the border for a pork preparation. Except it wasn’t. El Taquito was founded in Tamaulipas, a border state where Matamoros and Reynosa are located. The original of the three Central Texas outposts, the official company line claims, was the first to introduce avocado and queso fresco, common taco garnishes on both sides of the Rio Grande, as topping options to Austin. A group of wait staff broke out into a ranchera when they learned it was a customer’s birthday. There was clapping. The clapping spread. As did the singing. To my left was a photo of Vicente Fernandez, the king of ranchera music. 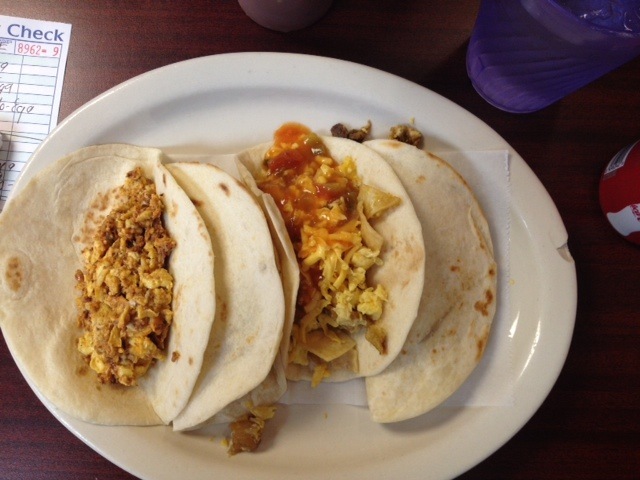 In front of me, at Joe’s Bakery & Coffee Shop in East Austin, was a platter of incredible breakfast tacos, flawless homemade flour tortillas—thick without being dense, fluffy without being mistaken for an old pillow—and all. Within one envelope was snappy dredged in flour bacon, firm eggs that bore a sheen, the heavy-handed spread of captivating refried beans. The pictured round breakfast sausage patties are one of only a couple of items not made in-house, but they have to be on the menu. 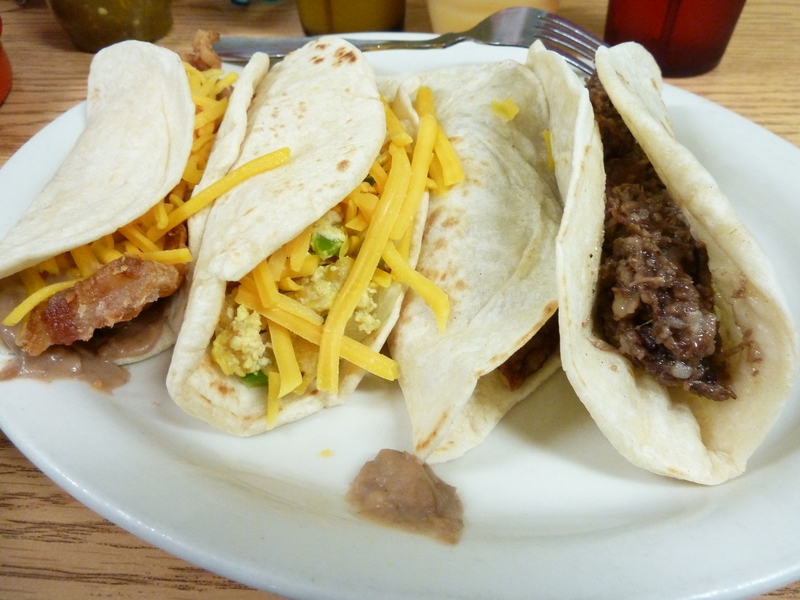 Reportedly, sausage patties are among the first ingredients placed in a tortilla in Texas to create a breakfast taco. Authors note: I wrote the backpage “Quench” essay for Imbibe Magazine’s Texas issue, the first issue dedicated to the drink culture of a single state. 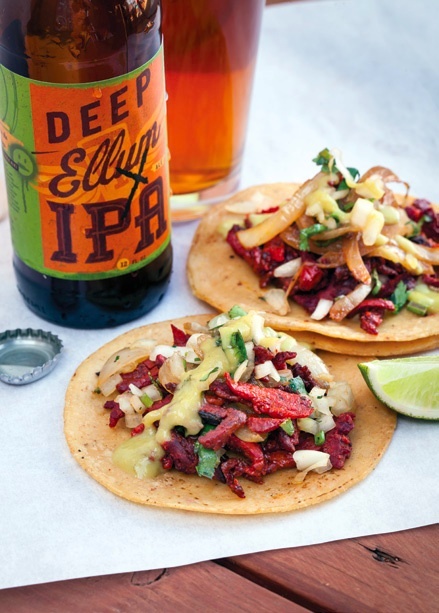 My contribution explores taco and beer pairings. To read more from the issue click here. After my wife and son, I have two great loves—tacos and beer. 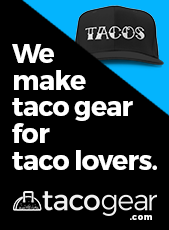 For my food blog, Taco Trail, I’ve eaten at hundreds of taquerías and Mexican restaurants in my adopted hometown of Dallas and across the United States. Meanwhile, I’ve logged countless hours at beer bars and craft breweries.